Happy New Year! VSN in 2013. Changes in 2014. The end of one year and the beginning of another: it’s the time for reflection on the year past and planning for the year ahead, whether in our personal lives or in our business/professional lives. And that is just what I’ve been doing here at VSN lately. Looking back at 2013, it’s been a good year for VSN. There are now 19 free sponsored eArticles on VSN’s eArticle page for you to enjoy. Those eArticles, posted monthly from June 2012 through December 2013 have been downloaded a total of 25,022 times (through 12/31/13) . . . and still counting. They will continue to be available and downloaded in 2014 as well, so that number will continue to rise. The smaller mini free eArticles (on Basic topics and Alcohol Ink) have been downloaded a total of 3,701 times through this same period. Not bad, huh? It’s been wonderful sharing the love of stamping with you. So what is coming in 2014? Changes! Some of the changes have already begun. All of VSN’s 226 back issues are now officially out of print. And that is just fine with most of you reading this. I’ve found that most people who wanted back issues, ordered them in 2012 and I haven’t sold more than a handful in 2013. It doesn’t make sense to keep paying taxes on the inventory and paying monthly fees to keep the online shopping cart up and running for this small trickle of back issue orders. So I will not be carrying any inventory into 2014 and will no longer sell them (either print or pdf versions.) As explained in my previous post, 12/30/13 was the last day to purchase them or anything on the Online Shopping Cart for that matter. The good news there is that you won’t be seeing any more posts here along the lines of, “please buy some back issues or place a yardsale order or make a donation” because there is nothing left to sell and in fact, the Online Shopping Cart is no more. Ta-da! This brings the focus more on stamping itself, which is after all the point of this blog. I also closed VSN’s PO Box location the other day. That was really weird I must admit because I’ve had that same PO Box for twenty years! The postal clerk who helped me close it up remembered the days when the box got lots and lots of mail, much of it stamped with wonderful artwork. These days, with everything pretty much online, I only get a tiny amount of actual snail mail each month, mostly bank statements and ads. (I got about six pieces over the past two weeks and three of those were from the post office!) So although it is sad to close up the box, it was definitely time for someone else to get some use out of it! One thing is NOT going to change. The 19 free sponsored eArticles are still available (and still free) on VSN’s eArticle page. So if you got a new eReader or tablet for Christmas and want to try downloading one of the alternate format eArticles, you still can. Or if you just need to fill in an eArticle you missed along the way, they are still there. Feel free to tell your friends who might want to read the eArticles, because they aren’t going anywhere and they are free to enjoy them! I’ve got some other plans for 2014 but I’m not quite ready to spill the beans on them yet. I’ll let you guys know first when I’m ready to announce it though! ← Today is Last Day to Purchase VSN Back Issues! I’ve thoroughly enjoyed reading your blog. My New Years resolution is to keep reading and learning from you. I have most all of your back issues, and do look at them from time to time. I do enjoy your daily blog and the E-artilcles, and am glad you will keep them going. I don’t do resolutions, but will keep on looking at your blog and e-articles. HAPPY NEW YEAR! Happy NewYear Nancie. 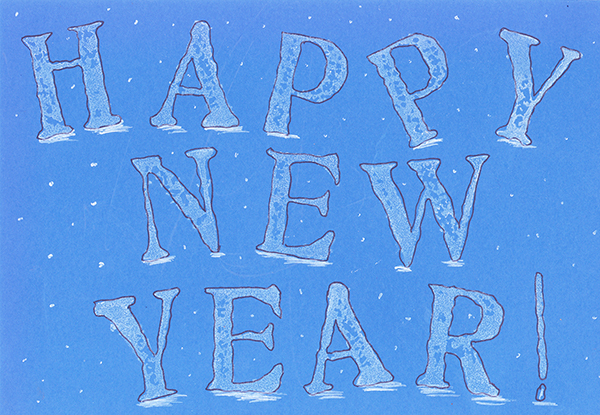 May 2014 be filled with blessings for you! You have enriched my life in 2013, a and I look forward to following your blog in 2014. Happy New Year! About every three years, I re-read my collection of Vamp Stamp News from (almost the beginning) to the very end. Each time, I remember a technique or a stamp….and re-discover the love of stamping all over again!